This article was originally published on March 18, 2011, in the Shenzhen Daily. Over the years, I've been excited to discover six more in the former SEZ besides the large one in Chiwan. 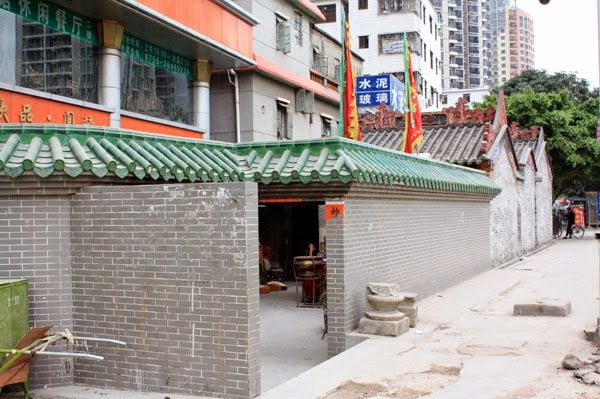 Four, not surprisingly, are in Nanshan, in the shadow of the grand temple. 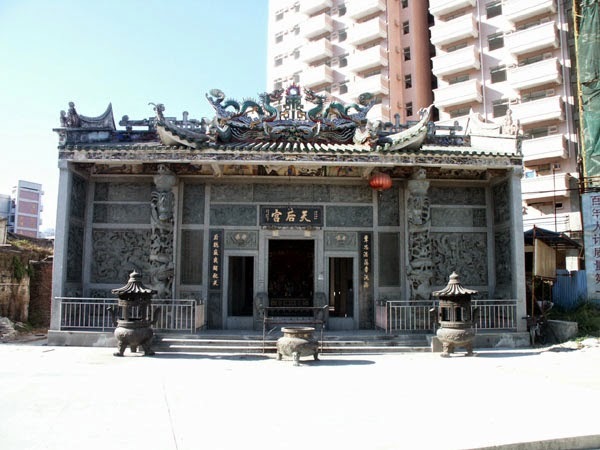 The first is styled "Mazu" rather than Tianhou (this is the name which lent itself to Macau). It can be reached at the south end of Mianshan Road on the west side of the Nanshan peninsula, near the end of Bus 42. 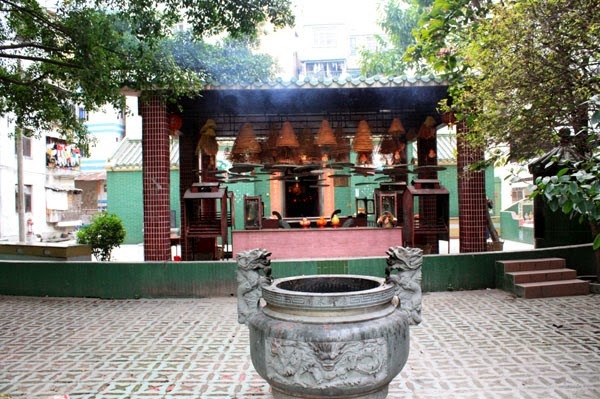 It is around the hill, as it were, from the better-known temple in Chiwan. The second, due north of there, is now a few blocks from the sea on Taoyuan Road just east of Qianhai. The third and fourth in Nanshan are on the other side of the peninsula. One is in Wanxia just south of Gongye 7 Road, between Airong and Houhai Road. South of the Wanxia Cun bus stop, walk east until you see the back of the temple. 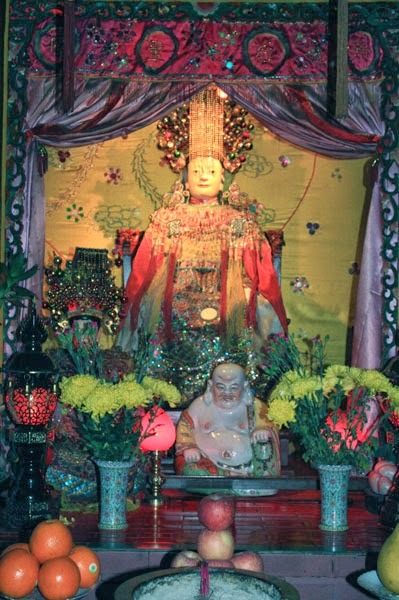 The other is on the west side of Houhai Road, between Chuangye and Dongbin. 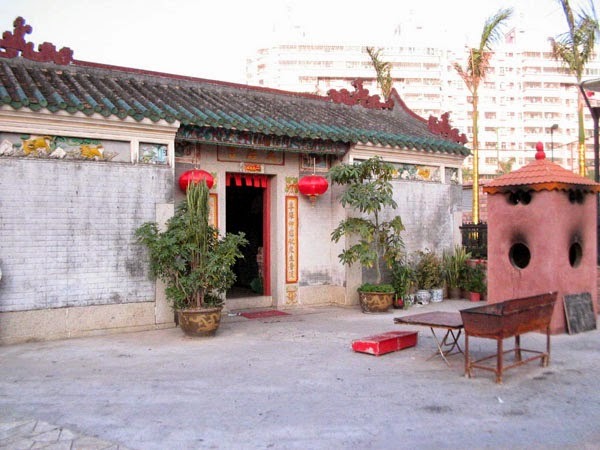 Outside of Nanshan, one other Tianhou temple is in Futian, on the plaza in the seaside village of Shangsha. And the last one is inexplicably landlocked, in Sungang Village in Luohu, facing the train tracks and next to the "Site of the Merits" walled village. The shiny new Tianhou Temple in Sungang Village, next to the "Site of the Merits"
If you have found any others, please let me know!